Lake Townsend, named in honor of James R. Townsend, City Manager of Greensboro from 1947-1961, is the largest of Greensboro’s municipal reservoirs. 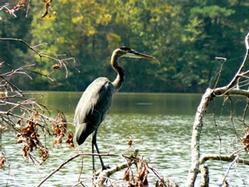 The lake encompasses 1,542 acres and is adjacent to the Bryan Park Complex and Golf Course off Highway 29 North. The lake was built and open for recreation in 1969. Lake Townsend offers boat or pier fishing, pleasure boating, and sailing. Popular fish include largemouth bass, hybrid bass, catfish, and crappie. Rowboats, kayaks, and sailboats are available to rent. Lake Townsend is the home of the Lake Townsend Yacht Club with membership open to the public. Sailing classes are offered during the summer months through the yacht club. A large boat ramp is available for private boat launching, with another launch ramp for small sailboats. Lake Townsend Watershed park is closed on Wednesdays year-round. Sunday opening hours for all three City lakes is 8 am.